The dust is only just starting to settle on E3 2018, and there were all manner of big reveals and even bigger demos at this year’s show. From the experimental keynote from Sony to the big teases from Bethesda, there’s been plenty to talk about in the world of video games. Microsoft confirmed it's working on the next Xbox; Ubisoft unveiled a new Star Fox game (kind of) and Fortnite finally arrived on Nintendo Switch. So to ensure you’re fully in the know, we’ve gathered together ten of the biggest announcements and takeaways from E3 2018 so you’re fully versed in all things new in 2018 and beyond. Microsoft had plenty of new games to show off during its own E3 2018 broadcast, but it was its announcements in the world of hardware that made some of the biggest headlines. As its keynote drew to a close, head of Xbox Phil Spencer confirmed that the platform holder is now hard at work on the next generation of Xbox. Considering we’re four-and-a-half years into Xbox One’s life cycle, it’s no shock to hear a new console is in the works, but it’s nice to have it officially confirmed. Spencer also mentioned, “Xboxes,” during the same announcement, suggesting Microsoft may be planning on more than one iteration a la Xbox One X. While Sony would go on to showcase just much dividends a heavy investment in first-party development can bring, Microsoft showed a similar pledge by bringing five new studios into its first-party club. The big investment includes Forza Horizon 4 developer Playground Games, State of Decay 2 studio Undead Labs, Hellblade creator Ninja Theory and Compulsion Games. It’s also set up a brand new developer called The Initiative. It’s a big commitment, but at this stage it seems like an investment most likely to benefit the next Xbox than the current generation of hardware. With the success of Mario + Rabbids: Kingdom Battle we were fully expecting another partnership between Ubisoft and Nintendo, and the Ubisoft E3 2018 show didn’t disappoint. Along with the confirmation that its toys-to-life space exploration title is due on 16 October, Ubi also revealed the Nintendo Switch version would come with an exclusive Arwing modular toy along with Fox McCloud himself in-game. It’s a huge coup for the Switch version, especially with all the hype surrounding Star Fox at the moment. You’ll even be able to customise your Arwing, and see those changes appear instantly on-screen. Ubisoft’s E3 2018 keynote had plenty of big announcements - including some intriguing pre-alpha gameplay for Beyond Good and Evil 2 and the confirmation that Assassin’s Creed Origins is indeed set in Ancient Greece - but few got tongues wagging as fast as the return of motorcycle racing/platform hybrid, Trials. The latest addition, Trials Rising, will be a globe-trotting affair that harks back to the game’s ultra-challenging roots, and will also be the first title to appear on a Nintendo platform. It’s due to hit PS4, Xbox One, PC and Nintendo Switch in February 2019. Considering it’s been six-and-a-half years since the last proper instalment in The Elder Scrolls series - no, we’re not counting The Elder Scrolls Online or the Legends card game - it’s about time we saw something of the next numbered instalment. With myriad Fallouts and Wolfensteins since Skyrim in 2011, the assembled viewers for Bethesda’s E3 2018 keynote were treated to a brief sweeping shot of a mountainous region and the words ‘The Elder Scrolls VI’. No release date, no gameplay, there wasn’t even a subtitle. There’s no guarantee we’ll even see it this generation, but at least we know it’s coming. While all of the four big games Sony presented at its E3 2018 showcase were all impressive in their own way, the awkward format and pauses between each demo (the show was created to be a walkthrough experience for journalists in attendance) did put a damper on things. And while The Last of Us Part 2 teased an older and more deadly Ellie, it was the stunning vistas of Ghost of Tsushima that left the biggest impression. Set in Feudal Japan during the Mongol Invasion of the late 1200s, its sword fighting looked even more epic when set against fields of swaying grass and showers of cherry blossom. It’s been almost 20 years since Capcom’s seminal action horror masterpiece somehow outdid its predecessor to put interactive nightmares firmly on the mainstream map, so to celebrate Capcom has completely rebuilt the game from the ground up just like it did with the Resident Evil Remake in 2002 and 2015. That means it’s the same atmospheric survival horror experience, only now with a third-person/over-the-shoulder camera and modern controls. It’s due to arrive on 25th January, 2019, and will support 4K thanks to the same RE Engine that brought Resident Evil 7: Biohazard to glorious and terrifying life. Perhaps the worst kept secret in 2018, with all manner of leaks appearing over the last few months, Epic Games has finally confirmed Fortnite is coming to Nintendo Switch. In fact, it launches on 12th June from 10am PT/6pm BST. The game’s Battle Royale mode is free-to-play, and tasks you with dropping into a large, lush map where you’ll need to scavenge for weapons and gear and systemically eliminate other players. One of the big selling points over PUBG is the ability to build walls and ramps on the fly, so you can create cover or reach higher points on the map in seconds. Nintendo went all-in for Super Smash Bros. for Nintendo Switch - or Super Smash Bros. Ultimate as it’s known now - with over 20 minutes of detailed breakdowns of all the new characters, changes and updates. So every character that’s ever appeared in the franchise - including one-shot DLC fighters - will all return, making for the most comprehensive roster ever. You’ll also need to unlock them over time, making them more of a reward than a standard feature. The game will support most amiibo related to said characters, and each fighter has had their looks, voice over and special abilities tweaked for this brand new instalment, due out on 7th December. Yes, you read that right. Since the classic GameCube pad has remained the standard controller for most (if not all) Super Smash Bros tournaments (from amateur level right up to the pros), Nintendo has heard the cries of its fighting faithful and confirmed that the new brawler will support GameCube controllers right out of the box. 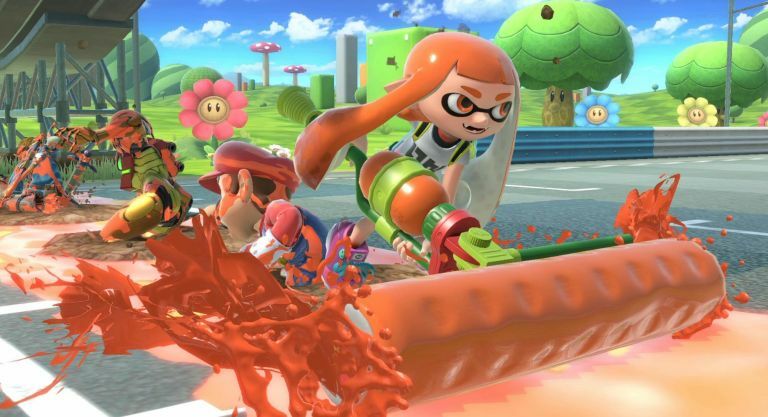 If you’re new to the series, the support might seem a little reductive, but if you’re a long-time player with a specific main, the mixture of a full roster and support for the community’s favourite pad is a fan-pleasing concoction indeed.